In light of Bridesmaids’ worldwide success, director and former Sabrina The Teenage Witch actor Paul Feig continues in his efforts to shift emphasis onto female comedic talent with mismatched buddy comedy The Heat. By embracing and paying homage to its roots, and combining the talents of those in front of and behind the camera, what transpires is mostly solidly entertaining, but not nearly as commanding or edgy as it assumes it is. Confident and efficient, yet brash FBI special agent Ashburn (Sandra Bullock) is sent on an assignment to Boston to bust a drug dealer and prove herself worthy of promotion. 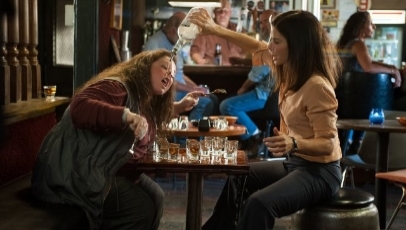 Problem is, in order to accomplish the task at hand, she must find a way to work with unconventional local detective Mullins (Melissa McCarthy) – something that not only brings about minor bickering, but also lands them in dangerously hot water. As interesting and full of potential as The Heat’s concept is, it’s difficult not to feel let down by how hit-and-miss it turns out to be. Katie Dippold’s script is less adventurous than expected, with a bulk of the ridiculous 117 minute run time coming across as filler. Sub plots such as the relationship between Mullins and her mother are hinted at, but then discarded, and many of the ideas have so obviously been plucked from other buddy comedies that it becomes tiresome. It’s a relief, then, that it hits the mark in many of the right places. When firing on all cylinders and focusing on the highs and lows of Ashburn and Mullins’ tumultuous relationship, it’s really very funny, and incredibly sharp (two bar scenes are perfect in capturing this). The characters may not be particularly well written, but the way in which they’re played and fleshed out by both Bullock and McCarthy ensures that it never becomes too much of an issue. There’s parts of the film that work far better than others (the diner scene where Ashburn attempts to save a choking man is a particular highlight), and the humour can often be said to play too much into the fact that this is a cop comedy featuring two females, to the point where vaginas jokes are hurtled at the screen at an alarming rate. But then it’s happily saved by a skilfully played scene that showcases the leads’ talents or a guiltily amusing gag involving a frequently verbally abused albino cop. All in all, The Heat is an erratic comedy that succeeds on the back of some neatly played wit and the winning chemistry between Bullock and McCarthy. Bullock plays it mostly straight at Ashburn, slowly letting herself go the more Mullins ribs her about her highly strung appearance, while McCarthy steals the show with her blazing raw talent. It’s fairly forgettable, but with a soundtrack that’s filled with hip-hop beats and a female empowering heart, it’s a fun ride and decent homage to the buddy film. I did find it fairly forgettable. I really enjoyed it, but I had to stop watching it in the middle and after I had finished it, I forgot that I had finished it. I would say this movie is saved by the talent of Bullock and McCarthy. Without them a lot more issues probably would have been highlighted. I completely agree. Bullock and McCarthy bring their A game which, in turn, raises the entire film.